Materials: oil on canvas. Dimensions: 120 x 187 cm. Nr. : P02310. Source: https://www.museodelprado.es/uploads/tx_gbobras/P02310.jpg. I have changed the light, contrast and colors of the original photo. Materials: oil on canvas. Dimensions: 100.3 x 136.4 cm. Nr. : 1930.500. 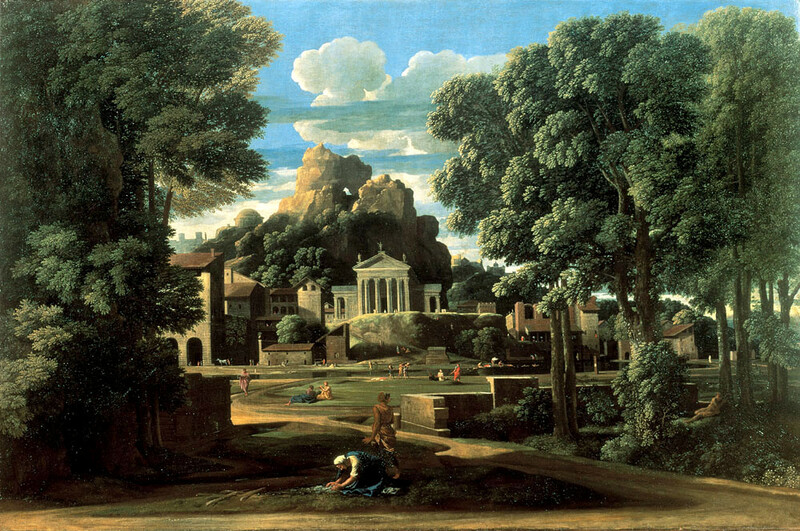 Source: http://commons.wikimedia.org/wiki/File:Poussin_-_Paysage_avec_saint_Jean_%C3%A0_Patmos_-_Chicago_Art_Institute.jpg. Materials: oil on canvas. Dimensions: 116.5 x 178.5 cm. Acquisition date: 1984. Nr. : WAG10350. 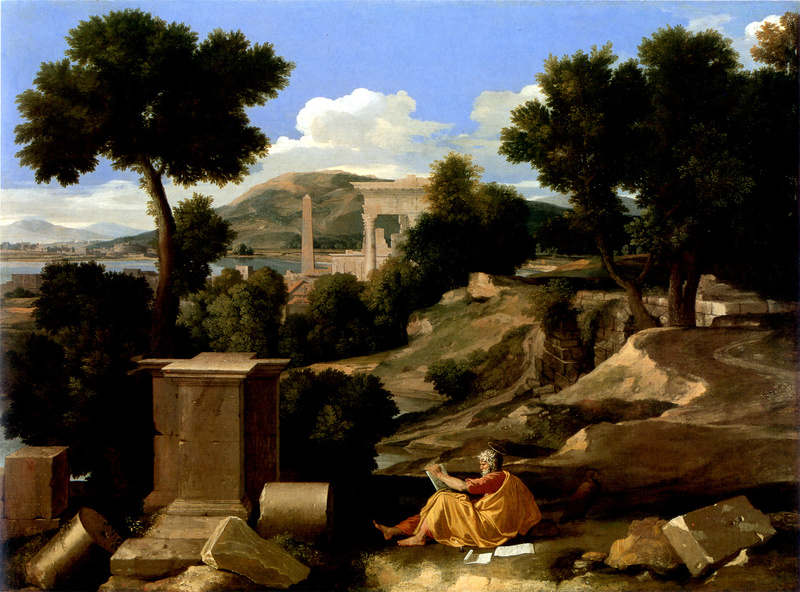 Source: http://silverandexact.files.wordpress.com/2010/07/the-gathering-of-the-ashes-of-phocion-by-his-widow-nicolas-poussin-1648.jpg. I have changed the contrast of the original photo. around the picture. The white shroud and the shape of the body immediately draws the eye to the bottom of the painting, to the main subject of the work. 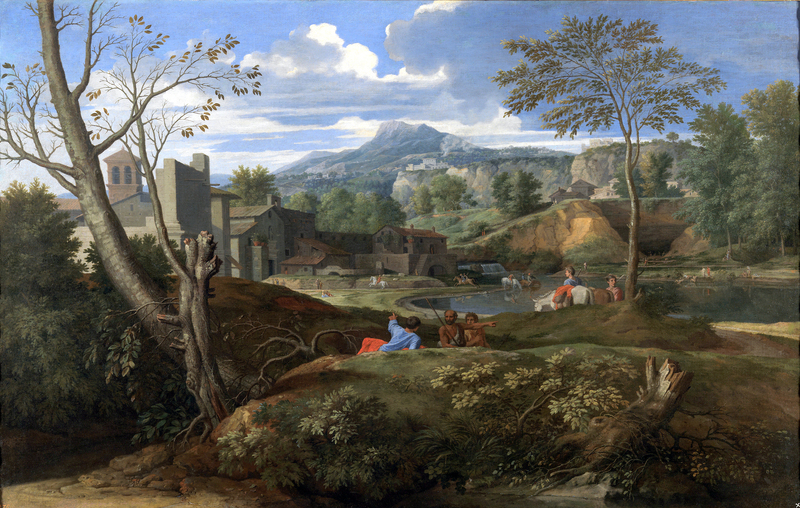 From here the road on which they have travelled leads the eye along a zigzag path into the painting, back through fields, towards the city and into the far distance. The wild and neglected land in the foreground becomes more pastoral towards the middle distance. The curved shape of the tree in the foreground also helps to lead the eye into the centre of the picture. Rhythm is introduced by the repetition of elements like shapes and colours. Tree shapes are repeated, and the red clothing worn by many of the people moves the eye from one part of the picture to another. 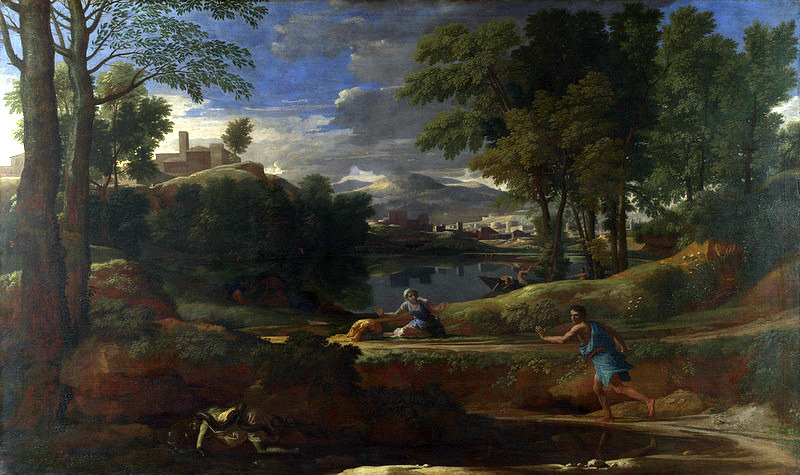 Athenians in the middle of the painting continue to go about their daily activities despite the presence of a dead body in their midst. A snapshot of daily life is given through the portrayal of people bathing, playing instruments, tending sheep and praying. The illusion of distance is created through the use of perspective. Objects appear smaller in the distance and become larger as you move into the foreground.